SIGNS – What do you believe? A few years ago when I was single and having – oh so much fun – in conversation with, shall we say, a person very direct about their beliefs. He was a devout youth minister who expressed his ways in a very upfront manner. No secular music. No mark on your record. No sin whatsoever – you get the idea. He was a nice enough guy, it was interesting to hear his views, as long as he knew I had some of my own (ahem). I think that was against his *rules*, but I digress. Aha, now he is getting it, err no, he sounded a little disgusted by this answer. Yep, I definitely hear the sneer. Imagine all the dating, romance, soul mate dreams come hurling from the sky (like an alien ship- ha) crash burning to the ground in a fiery pillar of smoke and blue flames. Phoooosh! Oh well. I’ve given worse answers than that, I am not perfect and you know what? I stand by it. To me it’s a Christian movie, whether it has aliens in it or not. I am not ashamed to say I am a HUGE syfy fan. It passed down from my step dad when we would watch Star Trek together. I love it. I love the imagination. I love the other-worldly-ness. Does that make me a bad Christian? I don’t think so. Wasn’t Mary supernaturally impregnated? Aren’t Angels supernatural beings? Didn’t Jesus supernaturally rise from the dead? Is syfy really such a bad thing to believe in? Can’t we all just get along? SIGNS is my favorite Christian movie because it is a movie about faith. Faith being tested. Faith picking a side. Determining what you DO or DO NOT believe. Let me give you a quote from the movie, this is Mel Gibson speaking who plays a former pastor. He has turned from his faith after a tragic loss in his life. He does not believe in God anymore. Alien ships have shown up and his family is questioning what will happen to them. He gives them this answer to decide for themselves what they believe, and to decide for themselves, what will comfort them. People break down into two groups. When they experience something lucky, group number one sees it as more than luck, more than coincidence. They see it as a sign, evidence, that there is someone up there, watching out for them. Group number two sees it as just pure luck. Just a happy turn of chance. I’m sure the people in group number two are looking at those fourteen lights in a very suspicious way. For them, the situation is a fifty-fifty. Could be bad, could be good. But deep down, they feel that whatever happens, they’re on their own. And that fills them with fear. Yeah, there are those people. But there’s a whole lot of people in group number one. When they see those fourteen lights, they’re looking at a miracle. And deep down, they feel that whatever’s going to happen, there will be someone there to help them. And that fills them with hope. See what you have to ask yourself is what kind of person are you? Are you the kind that sees signs, that sees miracles? Or do you believe that people just get lucky? Or, look at the question this way: Is it possible that there are no coincidences? Do you react to the scary things in life with fear? Or hope? Is it luck? Or more than coincidence? I’ll tell you this, the last month has been very scary for me. I’ve had cold feet – from marrying the greatest guy in the world – I know, WHAAATTTT? I believe it’s psychological. I had an abusive spouse that I freed myself from. My safe haven is my current home, and now to give that up for my new husband in October…..well…..It feels like I am giving up my new-found freedom. My “safe” place. And then what? Am I back in crazyville? Oh heck no! Not doing that. Nuh-huh. So, I get anxious and teary – more than a few times. Maybe, even a little nit-picky about my new mate. A little harsh. I am scared. Literally frozen. My heart thumping out of my chest to even consider writing the 30 day notice to my duplex and moving my things. Taking this giant leap of faith felt more like a free fall or being a rabbit about to dart away down the rabbit hole, just missing the steel trap door closing on it’s cute powder puff tail. But I AM free, either way, either house. I am still free. Not only am I free, but Jason would never treat me badly. I know this, so what’s the deal, right? Maybe I wasn’t looking at the signs. Here is what I see looking around. Despite my turmoil at the time, I celebrated our second anniversary meet date and wrote a blog post about how we met. The how we met post. That post became one of the most viewed – ever. Then at work, I win the drawing for a round trip Continental ticket to anywhere they fly in the US48, Canada, or Mexico and guess what? It includes a companion pass with it. Honeymoon tickets anyone? This happens on the tail end of financial difficulties from my past (ex #2) that cut the wedding budget to bupkis. Better than that, I discovered I have a plethora of hotel points through Radisson. I have never collected points of any value, but this year I did. Over 200,000 and that puts me right at a free hotel room stay – four to five nights long. TOTALLY FREE. Finally, couples are supposed to be complimentary right? I was diagnosed with a hyperthyroidism in December. I have to take medicine to make my thyroid stop producing. Jason texts me a few days ago. He now has a thyroid problem too. He has hypOthyroidism which means – his thyroid doesn’t work. Mine overworks; his doesn’t work. If only we could be each other donors. After this week of signs, my feet warmed right up. I know exactly where I am, and what I am doing. I have nothing to fear. And do you know what else? I see miracles. SIGNS, I believe them. I believe there are no coincidences and I believe we are in a supernatural world. I can totally understand why you might get cold feet, but I’m happy they are warming back up and you are marching forward. The unknown is always scary, but also wondrous and full of hope. I’m very superstitious. I think it started from my baseball playing days. Ball players are the worst. Or maybe my father. Does that count? One of the Guys – I hear it’s totally normal to have cold feet. As long as I don’t take off at the wedding like arunaway bride. It should be okay. LOL. Interesting on your superstitions. Yes, baseball has all sort of rituals. I think those are really funny to hear about. I once changed my shirt 3 times when OU was playing for the championship in the Orange bowl. Nothing worked, so I can’t wear THOSE shirts anymore. HA. As usual, a really well written post! I too believe in signs, and moreover, believe in an active God that provides them. 🙂 Of course, prayer is paramount in order to ensure that God is opening a door and it’s not just wishful thinking. And two of my favorite Christian movies are The Matrix (no, not Neo’s parallels to Jesus, since I refuse to view Keanu as Jesus, but the fact that life isn’t as you see it) and Gladiator (the General became a slave, the slave became a gladiator). Hope you have a supernatural weekend! Pop – It really is interesting how most movies can be related to a personal view of religion. Battlestar Gallatica is interesting in that it relates to Mormonism. I love your movies. Great picks! Watch out for the agents. yes I believe in those little signs that tell us where and what to go/do. Things happen for a reason. The unknown is always scary but sometimes these signs take you into those unknown areas. Yogasavy – Seems like the unknown is place that brings about strength from conquering the fear. Once you learn and explore it’s not so scary. I really don’t believe in Aliens. But I do believe in faith, and i don’t complain about others in this point. Signs was an incredible movie (Yeah! ), and I loved to watch (three times :D). Nice post. Talk about beliefs give me the creeps xD. But you did well here. Good luck with your signs!!! Lugon – I am the same way. I don’t believe in aliens, although I LOVE the imagination in creating and bringing them to life. That is talent! This movie really spoke to me It’s really about choice in the face of conflict, something we can all relate to. Another awesome, thought provoking post. My favorite Christian BOOK (made into a movie) is Stephen King’s The Stand. It is about the neverending fight of good against evil. Right at this moment, I can’t really tell you what I believe. If I figure it out, I will let you know. Judie – THE STAND – the only book I have read at least three times and that doesn’t count the movie mini- series. For some reason end of the world stuff fascinates me. I have very strong faith, but I don’t believe in hurting others to prove your stand on beliefs. To me this movie was about choice, not judgement, and that is what appeals to me. We all have choices and can choose to believe what we do and be respected for it. What a great post. I very much believe in miracles. I am at 18 months remission from Stage IV Inflammatory Breast Cancer. Medicine did have something to do with that, but I also think God and prayers had even more to do with it. Big praise on your wonderous recovery. Through medicine, prayers, God, and your willing spirit much was achieved. LIFE. 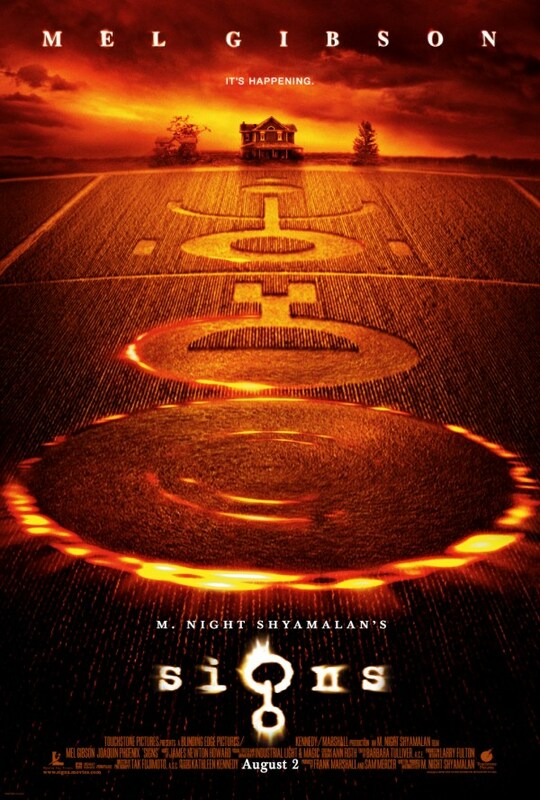 Signs is great if you like syfy and a little scary (to some). That was fantastic! I do believe in signs and I listen and look for them. Sometimes the signs, so to speak, leave goosebumps on my arms. Laura – Your comment reminded me of a book called, The Tenth Insight. It was long ago that I read it but it broke down what everything means and how to uncover these layers of signs in your life. I distinctly remember a bird being a sign and thought that was pretty cool, since birds are kinda freaky anyway. Very cool about your signs! I am not a religious person, but I do believe in fate. If you really want something in life and go after it heart and soul you can often make it happen, but I also believe some things are just meant to be, no matter what. Jane – Actually that makes me feel better. I really didn’t have cold feet in my first two (failed) marriages. Maybe, this is a good “sign”. I think as you long as you have hope and not fear then your life is very much heart and soul. I know your spirit shines through your words and I am grateful for that. I can see how your past had you getting cold feet. I honestly cannot relate because when I got married there was no doubt. Not one single sliver. At one point before I met my hubby I was mad at God because he wouldn’t “fix” my boyfriend. I know he could have, but he wouldn’t. So I like a child, I got mad. When I finally was ready to let go because I knew no “fix” was coming. I started wondering and worrying who God had in mind for me. By the time my Hubby asked me to marry him, there was no doubt in my entire being that he was the one that God had planned for me. But I understand your past is your past and it is different than mine. When I read the part about you winning the trip, I had to stop because my eyes filled up I couldn’t see! Yay! I am so, so, so, so very happy for you. God answers prayers and gives signs. Problem with me, I am not always so good at reading them correctly, but with that one you couldn’t misinterpret, huh? I am sooooooooo happy for you. Glad your feet have warmed up. So glad it is all looking so good. Terre – God always answers doesn’t he? Even when we don’t “get it” at the time. I definitely was NOT looking for Jason and even gave him back (just in case) God wanted to put his almost ex-wife back in his life. I loved his children and thought if they could be a family, then I would sacrifice. During our break up the divorce finalized. There was my “sign”. I have no doubt about Jason. He is the one. It’s just a mind trap from my past. The last effort of the evil ex to deconstruct me. I don’t have to worry though. I am at peace. Every time a new thing is thrown my way to confirm our relationship was planned by God (like the tickets). I get so overwhelmed. Amazing Grace. I am so happy you found your one. You keep hanging in there! Oh gosh, when Alpha Hubby and I were going to marry, I was SO nervous and yes, afraid. A huge “what if” kept sitting on my head. You know, what if he is a secret ax-murderer? I knew he could in no way be like my psycho abusive ex but man! I’d been single 12 years since psycho man and what if??? My stomach hurt, and when he moved his stuff in the week before the wedding, I’d walk around the house feeling like I’d been invaded and ohmygoshwhatamidoingamicrazy??? That as 16 years ago. I’m happy to report he wasn’t an ax-murderer. He is my best friend, my soul mate, boon companion, and an amazingly passionate and romantic man. Oh I’m so glad I didn’t run!! LBDDairies – Yes, I’ve heard these thoughts before! LOL. Funny, that’s exactly how it felt….perched on my toes ready to run. I think he’d catch me though. Or rope me. If he didn’t my mom or daughter would. HA. Fabulous post! Yes, it’s a sign…marry that guy like yesterday! 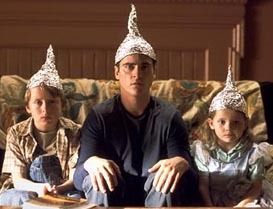 I love the movie Signs…I had to chuckle looking at the pic of them with the tin foil hats….I loved seeing that part in the movie! I once caught Sydney with 6 glasses in her room! We had a good laugh over that. I believe in the daily miracle, which is life, but nothing fantastic or supernatural. I think we’re walking blind, and have no idea what lies up ahead, but whatever it may be, we have the strength and resilience to make the best of it. nothingprofound – Yes, just look a pregnant woman and what started as an egg to the birth 9 months later, to the same child a year later. Life is most definitely a miracle! I think they are there for a reason – and when we “see” them…I really do believe we see them for some purpose. Love what you have been seeing – and how it’s given you extra assurance right now. Life is awesome…and it will just continue to be on these new life adventures that are coming…. Lance – That was the word I was looking for assurance. The signs come when I have the most doubt. I know they are meant to get my attention and it works. Life adventures are the best. Woo! Beautiful post! Happy for you and your family, and all the many blessings you have received over the past few months. Everything happens for a reason, and it is amazing when things just seem to fall into place for our lives. Continue to believe that good things do happen to good people. Happy SITS Saturday Sharefest! Come check out my baking giveaway..
Paige – I love what you say about good things happening. It’s really nice to hear. For so long, any good thing was scary for me because I just knew the other shoe would drop at any moment. Peg – FUNNY! That joke is so true. You can definitely wear blinders in life and miss what is going on when God is trying to tell you something. Truthfully, some people are just not sensitive to it. I’m heading to the altar! Don’t worry! HA HA. I think anyone who’s not scared of marriage is crazy! Lol. It’s a big commitment that’s blessed by a big God when he’s in it! I still remember the beautiful signs we received in those nervous days and hours before we were married. God is good! Jennifer – God is good! Thanks Jennifer. I am glad to know I am not the only one that has fears despite “knowing” it’s the right thing. Motpg – I’ve definitely not trusted my instincts and not listened to the signs. Boy was that hard. What a great post Angelia. Getting married again after an abusive first marriage you are bound to get cold feet. But don’t. Your eyes are wide open this time and if there were warning signs or perceived problems with your fiance I think you would have seen them by now. I’m glad you didn’t hook up with the guy at the beginning of your story. Yea…ummm…that would have been a tiring relationship! I’ve not seen the movie signs but I will for sure now! Hope your weekend is a happy one. Jenny – So funny about that guy! Yes, once I was dating Jason he wanted nothing more to do with me. We were supposed to be friends, guess not. I wouldn’t have passed the tests anyhow. HA. And you are so right. Thank you for that reminder. My eyes are wide open indeed. This post showed true courage and raw emotion. I have suffered anxiety most of my life and have to constantly work at keeping it at bay. It’s natural for my mind to wander to worry when I see bad things happen. I remember all the good in my life and find gratitude everywhere. Kellie – Wow, I really appreciate such a touching comment and sharing your story. Being anxious is VERY hard and VERY hard to control. I think how you deal with it is tremendous. Life shows us grace every day. I love that movie and Love syfy too! I don’t think I have ever thought of that movie as religious, but I can see it now. Cold feet…I think you are projecting your fears from past relationships onto this one. It’s always a huge step in trusting your happiness to someone else. I sure hope those feet stay warm from now on. They say oppisites attract…hubby and I are total oppisites and we accept that. I believe that if you accept the person for who they are instead of trying to change them, you will have a long lasting relationship. Heather – Thank you! No, I don’t want to change him. He is a good man and I really don’t have any reason not to trust him. He is the most loyal faithful person I have ever met. This is an incredibly beautiful, thought provoking post. Who knew that there was so much to be seen in Signs?!? Awesome!! Thanks so much for being a part of my 100th blog post celebration. WOW! Talk about Signs and What I was SUPPOSE to read today! I, too, have a wonderful guy in my life. He proposed back in January and we both go back and forth about picking a date. It is both of us caught up in that fear of losing freedom. We both know we want to spend the rest of our lives together. We have actually been living together for a few years now….It’s just that commitment step. THANK YOU for your post. I am glad that I found this today. I will be back! Jules – Thank you for sharing your story. It comforts me to know, I’m not the only one to fear losing my freedom (which of course you won’t, he won’t, and neither will I). There is a lot of support just in these comments. Our wedding date came to us right away. It’s 10-10-10. Our daughters are 10yrs and 10days apart – another sign. I know you can be confident in your future happiness and your future moments. Good luck! I hope all the remaining wedding plans go smoothly. I don’t know what I’d do without my faith————-or signs!! I have no idea about signs but I do know that somehow I know when I do decide what the best thing is. I know that I have been given answers and how I relate to them is how I feel about them. If they make me feel good, I go for it. You feel good about Jason, but your ego mind is making things up. We all have that happen, thank goodness then for what you see as signs that allow you to access your heart and let you know all is well. Yes, giving up your independent can be difficult but collaboration is much more fun. Wilma – My ego is crazy for sure! I’m really glad to know it’s not me. I definitely want a sponsorship with Jason. I always have since I met him and yes I have much love and support in my life with no reason to fear anything – signs or not. You call them signs, I call them premonitions. They picture ahead what you are afraid of. They lead you to the right decisions. So don’t be afraid of the the yet unknown. The signs you spot around teach you to maintain your calm, so you should see to it that you always keep your feet warm. Then your fears simply vanish. Jason is not just a coincidence- he is your soulmate, Sweetie! Lita – Thank you, he is indeed. What beautiful words you have given me to always learn and keep my center calm. I think I will do much better from here on out. Oh yes and I believe in signs and the messages that go with them. I’m in trouble when I don’t pay attention to both! It’s funny how when I ignore signs I always remember ignoring them when things go wrong. Life is so much easier when I pay attention. What a beautiful, thoughtful post. Yes, I also believe in signs, Angels, Christ and all other manner of the Divine. I also believe that God speaks through people. I’m with you. I felt the same way about ‘Signs’ and I think you had a lot, A LOT, of signs. Sounds like all the signs are lined up for you! Great Blog and good luck with the thyroid issues.